We are delighted you will be joining us for a Music Mondays workshop. Please come to the MAIN ENTRANCE on California Street. Doors will open at 6:30. What to bring: Just yourself, ready to have a great time. Attire: Dress code is casual/comfortable. Please refrain from wearing scented products such as perfume or hair spray. I'm looking forward to working with you and sharing my personal love of the syncopated rhythms of Brazilian samba! We will talk about basic Brazilian grooves, Northeastern rhythms, Samba, Bossa Nova, choro and also do some listening! I will be bringing percussion instruments like shakers, scrapers, tamborims and more. There are no music music selections for the workshop, but here are a few resources for those who wish to practice some Brazilian rhythm patterns and to learn more about this tradition. 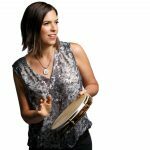 Ami Molinelli is a professional percussionist and educator specializing in Brazilian and Latin percussion. She co-leads the Brazilian and Jazz ensemble, Grupo Falso Baiano with two albums to their credit: “Simplicidade – Live at Yoshi’s” and “Viajando em Choro e Jazz.” Grupo Falso Baiano have been featured on NPR’s the California Report, Radio Latina and Pandora LIVE! Ami received her Master of Fine Arts from the California Institute of the Arts. Her performance and recording credits include theater, television (NBC) and live performances with artists such as Luciana Souza, Hamilton de Holanda, Jovino Santo Neto, Danilo Britto, Nilson Matta, Romero Lubambo, Jai Uttal, and George Duke. Thank you to our workshop sponsor, Latin Percussion.